this template does not work in 3.0 every time its loaded it gives a error code. joomla loads the template but when you set it to default it locks up the site with errors, you have to go in to the extension manager and disable the template to get your site back. will there be a fix for this? Is this a mobile version also? how to add modules to the left? and how to put more than 4 slides? 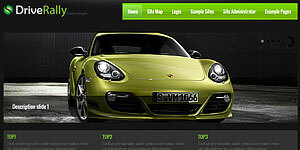 I am using your template “drive rallye” for my web site. Regards and thanks for your answer. This template does not work with Internet Explorer. How do I turn on the menu like the demo? and how do I turn on the images below the banner? I love the template and everything is straight forward and easy to use. The only thing I’m having a problem with is that would like to remove the Captions on the Slideshow. However, I have been unable to figure out what I need to edit out of the index.php and/or slideshow.php files. What do I need to do? Nevermind… I figured it out…lol. Great template! Great template! Thank you sou much! It is a great template. I love it. Thank you very much. But I found one problem that I made 3 columns of articles in one page. The 3th column doesn’t fit in the content body. It’s lost half of the article. On the Homepage is fine but the other pages don’t fit.Is there any suggestion? Could you please tell me? I love this template and I don’t want to change. Thank you so much.